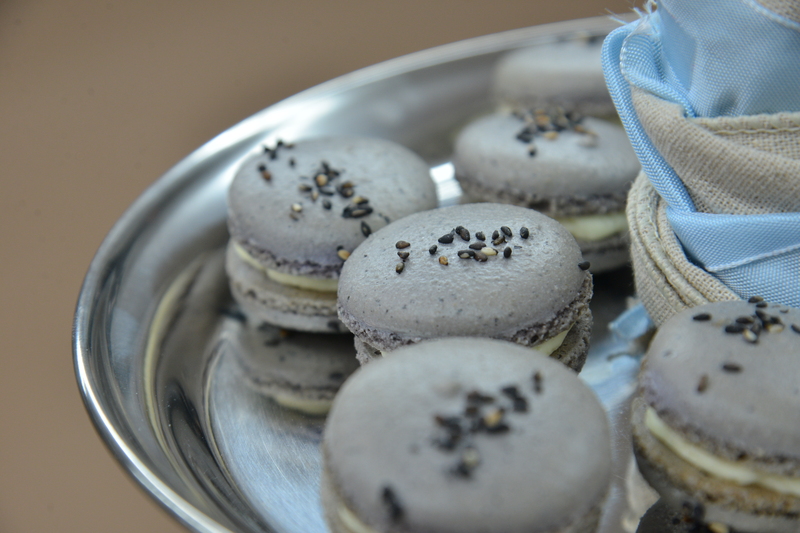 Stephanie Chen is paying homage to her Chinese heritage with her "Black Sesame Honey Champagne Macaroons." The special touch comes from inclusion of black sesame powder which is an ingredient that was included in a lot of the Chinese desserts she ate as a child. The judges playfully note that her choice of "macaroons" is pretty ambitious and ask why she chose it. Stephanie knows she has her hands full but is confident that she will rise to the challenge. Watch the full episode of "Finals Week" from Season 2 Episode 8 of The Great American Baking Show to see how well she fares. 1. Prep 2 baking sheets with parchment paper with drawn circles. Separate your egg whites and clean all your appliances to ensure there are NO traces of yolk, oil, fat, etc. 2. In separate bowls, sift the almond meal at least TWICE and sift the powdered sugar once. Whisk the two together and break up any lumps. Pour in half of the egg whites and fold them gently until the mixture is thick and paste like. 3. In a stand mixer bowl fitted with a whisk attachment, add the other half of egg whites and leave it there. 4. Start making the simple syrup. In a small saucepan, combine the granulated sugar and water together till they dissolve over a medium heat. Add candy thermometer. 5. Start to mix the egg whites until they get to a soft peak. If they get there too soon before the sugar is ready then slow the mixer down. The egg whites will need some volume before adding the sugar. 6. When the syrup hits 240 degrees F / 118 C, remove from heat and carefully pour into the side of the bowl while mixer is running. Make sure the mixture is being poured right where the eggs and side of the bowl meet. 7. Whip on high until the bowl is cooled and glossy stiff peaks have formed. 8. Add half of the meringue to the almond mixture and gently fold until combined and smooth. Then Add the rest of the meringue until batter is smooth and ribbons form. Do NOT over fold or mix. 9. Preheat oven to 300 F / 148 C. Fill piping bags. Might want to secure the parchment paper down with a little of the macaron mixture. 10. Pipe small rounds with the bag perpendicular to the baking sheet and make sure they're the same size by counting how long you pipe them out. When you're done, tap the trays on the table to get rid of the air bubbles. 11. Add a few toasted black sesames to each of the cookies. 12. Let the piped macs sit out until a shell is formed. Should be 20-30 minutes (maybe less). 13. Bake one sheet at a time for 15-18 minutes. Rotate the tray after 7 minutes. Test the macs by wiggling the top of the shell back and forth. If the shell moves from the feet then they need another minute or two. Perfect macs should be a little wiggly but overall firm. 14. When done, remove parchment paper from the sheet and let cool for 30 minutes on cooling rack. Gently peel the parchment paper off when they are cooled. 1. In a stand mixer bowl, beat the butter using a whisk attachment for 2 minutes until light and airy. 2. Slowly add the powdered sugar and whisk until it's all incorporated. Then add honey and champagne with the mixer on. Keep whisking for another minute until everything is incorporated. 3. Add more champagne until the right consistency is met for a firm, pipeable filling. 1. Add buttercream to a piping bag and pipe into cooled macaron shells. Pair the shells. Make 12 total macarons.